And then there were three. I’m still not quite sure how it’s happened. 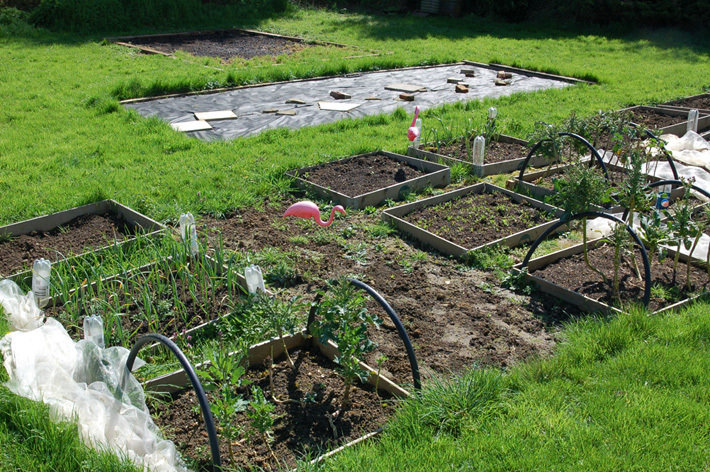 We had always envisaged space for three veg beds. But after the great effort made by an army of friends to get the first one going, I’d assumed numbers two and three would have to wait a while yet. However, the earlier winter clearance led to moving the woodpile, which in turn led to having another no-dig bed almost ready. So now we’ve just got to decide what extra to grow. It’s a sign we stepped up a gear in March, perhaps without really knowing it, building on the winter clearance, spurred on by the arrival of Spring. As well as the two new veg beds, apple trees were pruned, various existing beds weeded, the overgrown fig finally cleared and pruned, and the first two trees in a possible new truffle plantation planted. Plus we weeded and fed the roof! Pruning the Beauty of Bath apple tree (left); and the fig (centre). Meanwhile here be truffles in 2022? (right). This entry was posted in Garden, Orchard and tagged apple trees, fig, ground clearance, Paul Rainger, pruning, Smallholding, Spring, The Secret Acre, truffles, veg beds, Winter, woodpile by paulrainger. Bookmark the permalink. As I too try to be self-sufficient, I’m constantly amazed how much food we need to grow. I was unaware of our mass consumption when living in the city. Whenever I think I’ve got the garden big enough, I realize I need to add more beds, especially when considering that rotations are needed.